Are you ready to celebrate back to school? With two teenage boys still at home, I may or may not have been partying since 7 am this morning... I want you to join in the fun by participating in this giveaway: one Color Theory jelly roll by Vanessa Christenson of V and Co. for Moda Fabrics. This giveaway is sponsored by my BFF Deb. Isn't she the best? - Leave a comment below telling me what was fun about your summer. Anything goes: a project you made, a meal you had, a trip, etc. 2. For yet another chance, let me know that you follow me on Instagram ( @piecedbrain ). - If you are a noreply blogger, please leave an email for contact in case you are the winner. Be sure to write it as "soandso at gmail dot com" so you don't get spammed. This giveaway will end at 5 pm this Thursday, August 25, and it is open to both the US and international friends. Let's party together! OK, I will start. This summer I enjoyed my mom's company for two months. She lives in Brazil and I had not seen her in two years. Yikes! Loved her cooking, her jokes, shopping and traveling with her. Sure I can think of other things I liked, but having her around was the best treat. Now it is your turn. I am looking forward to reading your comments. In the meantime, I will dance the day away! We had a pretty low-key summer around here. We had a few short trips, one to Minnesota and the other to Wisconsin and both were fun! The best part of the summer was having more time to sew! Yes, I could've and should've gotten other things done around the house, but those things aren't fun! Enjoy your days with those boys back in school! I'm an Instagram follower too...had to check! This is my first summer being a mom and though I am sleep deprived, it has been incredibly fun showing my daughter the world outside, introducing her to swimming, and taking a zillion photos of her each and every day. And because it's so warm out, I haven't had to worry about tiny socks at all. I can't believe how quickly the summer has flown by but it was great!! We took several small trips to the city and up north along dirt roads; we worked on patching up two huge stone walls; and enjoyed hot and cold beverages on our front deck chatting with people walking by. The best thing about my summer was after a week the part for my A/C came in and I had cool air again in the bedrooms....giggle. Just a nice normal relaxing summer. I follow your blog through email subscription. And a new follower on IG. The best part of my summer was spending a week with just me and hubby in 25 years. First vacation with no kids. I finished my Swoon top this summer! I follow you through BL. We went swimming. A lot. Lol! Thanks for this chance to win! I follow you on IG too. This summer I started a new job so no time off for me. I was able to make numerous weekend trips to Dallas to visit my kids and grandkids! Which is always enjoyable. We welcomed a new grandbaby this summer!! I've done some sewing, and enjoyed visiting with some old friends. The best thing about my summer was the opportunity to spend some time with my family in Virginia! We had a nice vacation on the west coast in May to celebrate our granddaughter's graduations from high school and dance school. We visited to beautiful gardens, the Japanese Garden in Rockford, IL and the Rotary Gardens in Janesville, WI. Both are fabulous gardens. Yesterday, we surprised my sister with a birthday party for her 70th birthday. She has MS and has been a little down--this gave her a great pick-me-up. We had a fabulous holiday in Italy! I follow you with bloglovin. Thanks for the giveaway. Our road trip back to MI from PA to visit family was wonderful!! Following you on Instagram (snoozen552). Thanks for a great giveaway! We had a fabulous sunny and warm days.We had a week of vacation with family near the beach. When is back to school in your area? Here will be next month. Things that we enjoyed - finally finding a new home for us after a year of looking. We also enjoyed attending the Peter Gabriel/ Sting concert- a pair of artists that were on our bucket lists. I am looking forward to getting moved to our new home so that I can create some new quilts. I follow your blog on google + . 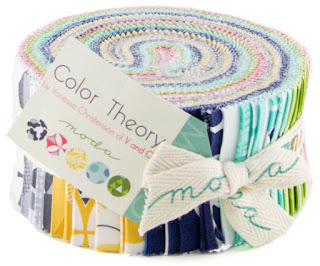 Thanks for the chance to win such a nice jelly roll. I'm re-arranging my sewing room - er - studio and cleaning up some of my fabric storage. Should make things I want to use easier to find. Big job. Promising myself not to let it get so messy again. And I follow your blog . . . I'm a follower through e-mail and Bloglovin. our summer has been very busy at church. VBS etc. My husband did a lot of traveling for work, so that was different. I have not done much quilting, but spent a lot of time with friends and family. I actually really enjoyed that the weather was not that hot in Switzerland. In the evening it was always cooling down nicely which makes summer for me just much mor enjoyable!Yay! not much excitement this summer as my husband started Dialysis and that takes up a lot of time. I also have been dealing with neck and shoulder issues so not much fun time for me as well. But I did get to shop online and get lovely kits, fabrics, and of all things doll ITH patterns. I make quilts for ill children, nursing homes and have had to slow down with those but I found the best place to get doll and stuffed animal ITH patterns and have been putting my embroidery machine to work..so much fun and I know the kids that will get these are going to love them. And I am very new to instagram and follow you now, yay! My fun thing this summer: traveled to Portland, Oregon and spent time with family!!! We took two vacations to the UP of Michigan this year - it was a blast! thanks! How sweet that your mother was able to visit, I enjoyed teaching my children to swim, but can't wait till they start school again either. I follow your blog and just got an e-mail from you. We spent most of our summer in the backyard pool. I had a very lovely summer, with trips to Ashland Oregon to see my son and a Shakespeare play, a trip to visit cousins in Seattle, a trip to visit my brother in Texas, and then a trip to Lake Tahoe to celebrate my husbands birthday. All were just long weekend trips, but nice to have them spread out for a great summer. Your visit with your mom sounds great...two years is a long time!! The best part of summer was the days I was able to just hang out with my grand daughter. Poolside is so much more fun with my best buddy. A new puppy is making my summer fun! The very best part of MY summer was a visit from my younger daughter! I live in Florida and she is in NYC so we do not get a chance to get together very often. We cooked and ate and worked on the family tree and talked and talked and talked some more. I follow your blog with email! I entered a few quilts in a quilt show for the first time and it was more fun than I'd ever anticipated. I usually give them away as fast as I make them, so this year I decided to wait to send them off to their new homes. I spent 6 weeks having my children and grandchildren visit. We had a lot of fun. Thanks for the giveaway. I follow you via email,mouth I'm thinking of changing to another way because by the time I get an email telling me you've posted, it's already an old post! I also follow on Instagram as ceciliaquilts. HI,we celebrated our oldest Grandson's Wedding this summer! So Neat!LOVE "COLOR THEORY"! THANKS FOR A SWEET GIVEAWAY! Summer was a lot of fun...lots of family in and out. I follow your blog by emails. I enjoy your blog so much as well as your tutorials. Keep them coming and I will keep on printing them out. Thank you. Our only trip this summer was a long vacation weekend in Williamsburg, Va. to celebrate my sister's 50th wedding anniversary. Thanks. This has been a summer of celebrations for me! First my best friend turned 80 (older than my mom! ), and I was privileged to make the cake for her party bash. It was the first cake I've decorated in 20 years, but it was loads of fun!!! She loves cardinals, so I made birdhouse and a white picket fence to go with some red beauties dotting the "snow" frosting. My daughter landed a life-long wish of a job at a vet's office as a vet technician! And I just returned home from attending my niece's wedding to the man she has loved and wanted to marry for 3 years now! I stopped and visited with my sweet mom - just me and her - for 4 whole days, which was definitely cause for celebration after her success in beating colon cancer last year. Woohoo!!!! I think that roll of sweet fabrics would top off the celebrations quite nicely, don't you? I'm a follower via email. Thanks again. I'm also a new follower via Instagram!!! Just being with the one that I love. I just enjoy his company so much and it doesn't matter where we go or what we do. It's just being together that matters to me. I follow by email and am very glad that I do! Fun thing this summer? Have completed several sewing projects - a bag, a couple of projects and 3 quilt tops. Looking forward to more in the fall. Follow you in instagram (@sarahbjasinski). This summer was spent watching my kiddos in swim lessons and then seeing my girl swim on her own! I spent two weeks in Italy this summer. A life long dream! I followed and liked! Taking grandson (3 1/2) to the children's museum while he visited takes the cake. This summer was about friends. A couple I helped get together had their first child together. They both bring children for other relationships but this one is of the two of them. Plus this friend become the national president of our professional organization. He brought me out of sabbatical to work to support him. I am loving this. Another friend is getting married this summer. After a nice long engagement, they are tying the knot. I love both sets of my friends very much and it has been great seeing their continued growth. I follow your inspirational blog via Bloglovin. One of these days I may get around to incorporating Instagram into my social media array ... but not today. Beautiful fabrics! Glad you were able to see your Mom. This summer I got to spend it with my son and grandson. My son just transferred to a new area so I was able to go visit and watch my grandson. It was super as I haven't been able to spend that much time with my son since boot camp. 😊 Also being with my grandson everyday was a special thing. I was truly Blessed this summer. I'm a follower via email and BlogLovin. This summer I turned 60 and my sister and family came 700 miles to celebrate with me. I enjoyed visiting Arkansas and the P. Allen Smith Garden Home with my sister. I gave her the trip as her 60th birthday gift. We are building our first house and are busy meeting with the architect on weekends. As we left his office one Sunday, a parade of men dressed in full samurai regalia and carrying war flags was marching down the street right in front of us! It was the day of one of Kyoto's most iconic festivals, the Aoi Matsuri. I spent many a day and evening on my new deck sipping beverages and doing hand stitching. Thank you for this great giveaway. hmmm some of the best days this summer were getting outside when it wasn't raining! We took a great family vacation this summer. My husband and I, and our 26 year old son went to Ireland and Scotland. I follow your blog on my blogger dashboard/GFC and by email. We got in a couple of camping trips with some dear friends. The best part of my summer was a swim meet/coast trip with my girls. The best part was seeing my daughter and 3 grandsons. The second best thing was making a Red and White Vortex quilt. Quite a challenge but oh so beautiful. The pool! The pool was/is so much fun this summer! My brother and my niece both got married this year. So I had two weddings to go to. My favorite part of this summer was a trip around our little province which included a visit to the quilt show in Saulnierville, amazing . Thanks for the chance. I follow via email . Glad you're mom was able to come and visit! Hmm, it's been a very quiet summer here. I think the highlight was I was able to go to a quilt show! It was a small, mountain one, but my dd and I had fun. Thanks for the great giveaway. It was a pretty great summer. I got a promotion at work. I went to a great quilt retreat a few weeks ago. The weather hasn't been terrible and I even got some fishing in. All and all perfect! Oh the garden could have been better but we still got some things canned and enjoyed our fresh veggies. I've been having fun this summer making scrap quilts and playing with new designs. Heaven! I got to travel to San Diego with my family to see my sister for a mortgage burning party. We had lots of great food and talked for days. Best way to vacation in my opinion. I also spent quite a bit of time sewing at home. This summer I had fun with family coming to see me! Yep, we were the destination. Fun this summer included prepping for baby # 3, who should arrive in the next 2 weeks. I loved having my grandchildren at our house for a week this summer. We all have a lot of fun playing in our 2 1/2 acre yard, even in 95 degree heat and humidity to match! P.S. I follow you via email. Hi Denise ! The most fun I had this summer was traveling 1100 miles home to South Dakota to see my brother and sisters. All 5 of us range in age from 59-70 and live all over the USA and abroad. Laughs a plenty !! The most fun I had this summer was going to my bf's family cabin way up north in the MN woods. It was wonderful. Family reunion in the Black Hills. We rented a lodge and enjoyed together time, including a hayride and BBQ cookout. I enjoyed a road trip with quilty friends to a quilt show and a shop hop on the way back home. We were able to go back up to Illinois and see Vietnamese friends who have recently been able to move back to the USA. I made some pillows and a name banner for my daughters classroom and helped her set up her classroom. She is a first year, first grade teacher this year! Still have a wall hanging of a map to finish got her. This summer I have got our house ready to sell. It has sold and now is in escrow, so now time to pack! I follow you blog via email! What I did that was fun this summer.... besides sewing and quilting for customers... we had our bathroom gutted and redone! So much fun:) haha!!! I had my kids over for the fourth of July. This summer, I made a trip to Canarias Islands with my lover, and it was just what we needed: sea, sun, relax! We had a mostly stay at home summer, but that was OK because I spent a lot of time tending to my flowers, and the effort paid off. They look fantastic! Thanks!